Having a VoIP business phone system in your office is a great way to keep open communication with your colleagues and employees without having to worry about paying a hefty price tag. With a VoIP phone system, you can provide your business with a multitude of features at a fraction of the cost of most phone systems that bigger corporations pay for. If you’re not convinced that a VoIP business phone system is right for your business, then here are five reasons why most companies are. As mentioned, the phone systems that Fortune 1000 companies use are too costly for medium and small businesses, which puts them out of reach of the competitive features these systems offer. With a VoIP based business telephone, you can get a hold of these same features, without the high expense. This is hard to find with any other traditional on-premises solution. What keeps the costs down for this service is that there’s no requirement to purchase software or equipment. This means no cost for upgrades either. But this won’t bar you from getting access to all of the latest features and software that come with the service you purchase. All you have to do is pay a monthly rate per user. The setup is fast and easy, in most cases not requiring the help of a technician. Your system is up and running within minutes. 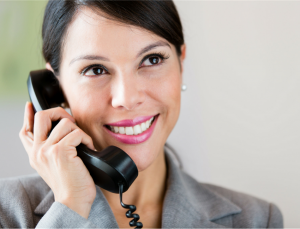 When you sign up for a VoIP service, it comes with an expert who manages your phone system. This ensures that your phones will operate at peak performance. Most providers offer a service-level agreement and technology that’s world-class. Make sure to learn about the security and processing engines that are being used by the provider to ensure this. The support that’s offered from the VoIP service provider should also be top-tier, allowing you to get access to an agent whenever you need to. If you’ve had issues with getting in touch with colleagues when you really need to, you can eliminate this problem with VoIP solutions. With one, you can have personal devices, such as tablets and smartphones connected to business lines, so that they ring when you dial their office number. This can also be applied to home phones. These settings can be turned on and off as needed. Voicemail can also be sent to your email inbox. Auto attendants are also available to help provide better customer service to clients and customers. With extension mobility, your workers can be accessed anywhere and anytime, which is ideal for emergency calls and team projects. With a VoIP phone system, the calls are carried through an IP data network. This means there’s no line capacity limits like with traditional phone companies. So no more upgrading your business with more phone lines, which cost you more for installations and raises your per month rate. The per person rate allows you to have all employees in your business to have their own phone line. Your service can grow or downsize with your business easily, since everything is virtual and just a phone call or click away. This means you can upgrade for seasonal peaks and downgrade during economic downturns without a hassle. The quality of the voices that travel through the Internet during calls can be kept at high standards. VoIP stands for the protocol used for the service, so it doesn’t mean voice over the Internet. A lot of people misconstrue VoIP as being low quality, but this actually comes down to your Internet provider. As long as you have high speed broadband Internet that’s reliable, you should have no problem with voice quality. Also, the features that come with VoIP phones can be compared to those of traditional business phone systems. The great thing about it is that you don’t have to pay extra for these features, like you would with a traditional phone provider. This includes features like caller ID, call forwarding, call holding, fax lines and recorded messages. It also offers a variety of features that aren’t found with traditional phone systems, including video calls, video conferences, chat capabilities and screen sharing. Even better, VoIP can be used on any device, including laptops, desktops, smartphones and tablets. With the cost-effectiveness, simplicity and feature-richness of VoIP business phone systems, it’s no wonder why so many businesses are adopting them into their infrastructure.